How many books and teachers say that the best magical tools are those which are made by their users? This is common wisdom because putting one’s own energy into an object’s creation infuses it with very personal power. But not everyone has the skills necessary to create every possible tool — have you ever tried to make your own Tarot deck, for example? Personal tool creation is powerful because creation is powerful. Creating the tool for one’s own use removes any concerns about the item’s history; if you made it and you’re the only one who has used it, then you never have to wonder about what it was used for before it reached your hands. Those of us with less talent for crafting objects of a particular type may consider purchasing one, but that’s a choice some people are uncomfortable with. There’s a not-uncommon belief that it’s not okay to buy magical tools — usually it’s narrowly defined, such as a proscription against buying your own Tarot deck, for example. The closer you are to the creation of a ritual or magical item, the better, but that doesn’t mean money can’t have a role. 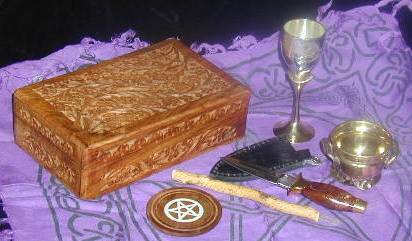 Most people who are comfortable purchasing tools take the time to cleanse or consecrate the new addition to their ritual family, but overlook an earlier opportunity to act with intent: charging the money for the purchase itself. It’s easiest to focus intention and energy through coins, because they are tremendously tactile metal objects. Using a small number of coins to represent the total you intend on spending is acceptable, and the coins are not even necessary if you’re comfortable enough with energy work. The first step is to decide what you’re buying. Divination, meditation, and good old-fashioned shopping are all perfectly legitimate tools to identify the exact ritual or magical tool that you need. If you’re not skilled at visualization, then you’re better off making the selection in person, so you can see (and ideally touch) the item for yourself. In these palms, in the now. This is a two-way energy flow: you visualize drawing the item to you, while simultaneously focusing on your intended use of the tool. In effect, you’re creating a contract with the item, and using money to bind it. Money is particularly good for contractual, binding work. 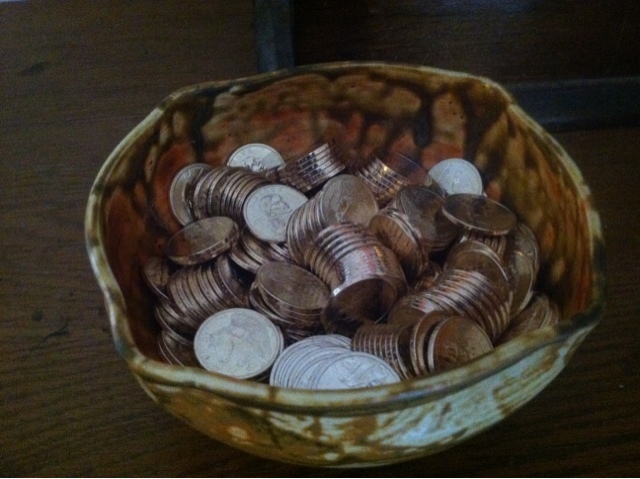 If you’ve energized coins for part or all of the purchase, then use it all for the transaction. A check or paper currency can be similarly charged, but if you’re working with a credit or debit card, be careful: it’s the money, not the card, which you should be charging. The card is a talisman for all of your money, and you don’t want to commit more than you intend. If a debit or credit card is going to be used for the transaction, don’t use it as a focus unless you’re confident you can visualize it as a conduit only. Working with money in its virtual form is perfectly valid, but requires stronger visualization skills, and a deliberate act of will to release the energy when you make the purchase. Money is energy and behaves as such, but it’s often easier to work with it energetically when you can feel cool, solid coins in your hands. I got a well-deserved kick in the pants a few months ago, which got me to finally present the workshop which has been floating around in my head for the past fifteen years. I came away from my first presentation of Dirty Money with a greater understanding of how money changes all that it touches. I suppose I’ve always known this; I carried a Susan B Anthony dollar in a medicine pouch in my youth, as a representation of the Goddess. I asked for stories of positive change due to money, and what struck me most was how many of the tales were tied to death. As we come to the end of our lives, the energy that we have accumulated in the form of money explodes outward and touches other lives. In the tarot, Death represents change, and the way money behaves is no exception. I love puns as much as any sadistic smart person, so the fact that money can be called change and is absolutely an agent of change is more than a little delightful to me. By what accident of fate do we have the same word for both change and change? I must assume that I come by my sense of humor honestly, by providence.